Pocket cruisers are known for cramming comfort into confined spaces and for economical cruising. 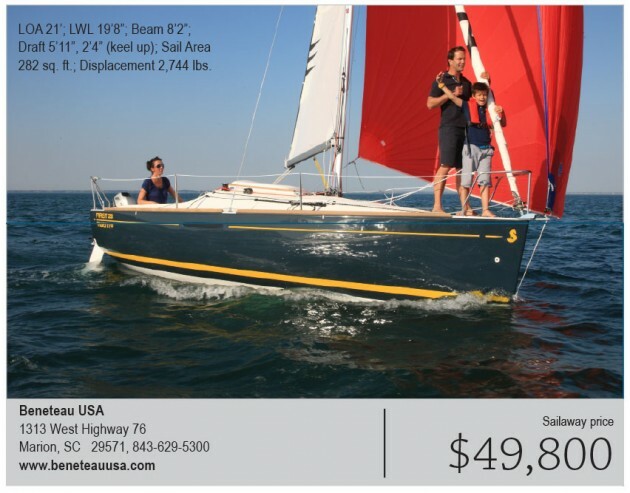 The traditional performance design features found in faster sailboats are expensive and can kill the fun of a pocket cruiser; long low waterlines let spray into the cockpit, big sails are a chore to handle on a small deck, and tender steering does not make for relaxing cruising. The Beneteau First 20 is a 21-foot pocket cruiser or daysailer that jumps over traditional performance design features right to modern, fun-and-fast features like a wide, flat stern, twin angled rudders, square-topped main, retracting bowsprit and an asymmetrical spinnaker. The boat looks like a smaller, higher-freeboard, more comfortable version of an Open Class boat, like it's the cheery cousin of a Mini 650. Beneteau calls the First 20 a "mini-yacht," but that simple marketing buzz word fails to capture the real essence of the boat-its on-the-water motion. Pocket cruisers and daysailers are often described not by their sailing characteristics but by unique or charming physical characteristics: the sheerline, the cut of the sails or the outline of the cabintrunk. They have eye-catching appearances that match their owners personalities, the way a bulldog walks like its stocky owner, or a borzoi's long hair waves like its owner's long locks. The First 20 is different in that it's not a saucy-looking boat; it's a sweet-moving boat. Its modest freeboard, higher than a sport boat, keeps sailors dry and creates room in the cockpit for comfortable seats. Two settees, a V-berth and sink make for a clean interior, but an optional water tank, folding table, portable toilet and fold-down mast kit turn this daysailer into a pocket cruiser. The mast is self-supporting, and the keel lifts for trailering so the boat can travel from lake to lake. Gone are the days when a 21-foot cruiser dies in light air. The asymmetrical spinnaker flies off a tidy on-deck bowsprit, powering the boat through light air using fewer lines than a traditional spinnaker. Roller furling tames the genoa in heavy air. The boat comes with a retractable keel for easy trailering or motoring into knee-deep water under an optional maximum 10-horsepower outboard that hangs between the rudders and pushes the First 20 out of the marina and into its natural environment.